When I was visiting my mother in Hamilton recently, one of her friends brought around a treasure for me to admire. 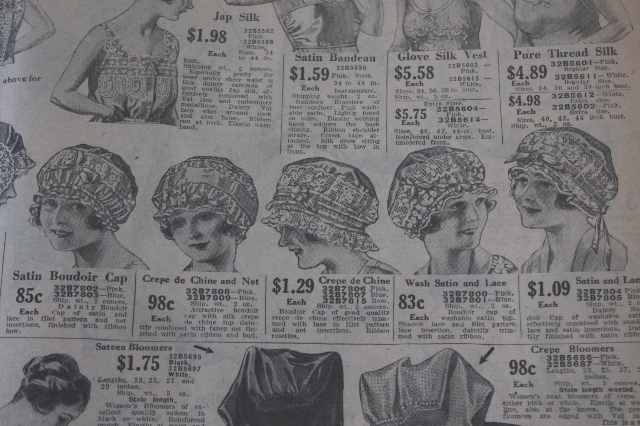 It is an American mail order catalogue for a firm called Montgomery Ward & Co., dated 1920. You might ask how it ended up in New Zealand. Well, one reason was that Montgomery and Ward shipped goods all around the world – to England, Europe, Asia, South America, Australia and, yes, New Zealand. 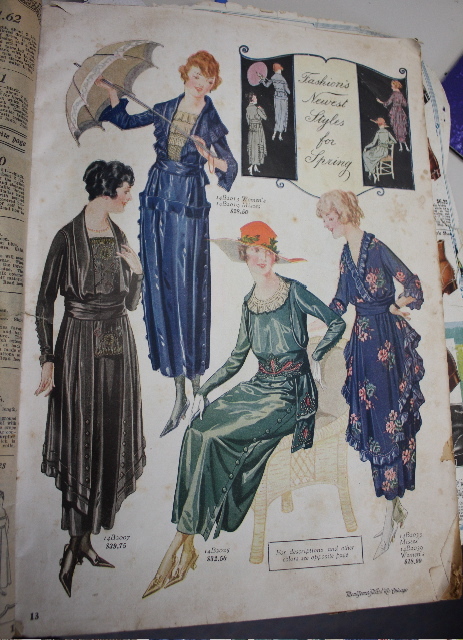 According to Jeannette (Mum’s friend) the catalogue came from a descendant of a well-known Auckland department store family, so perhaps it was used by the management to identify the season’s latest fashions in advance, or even to order stock. 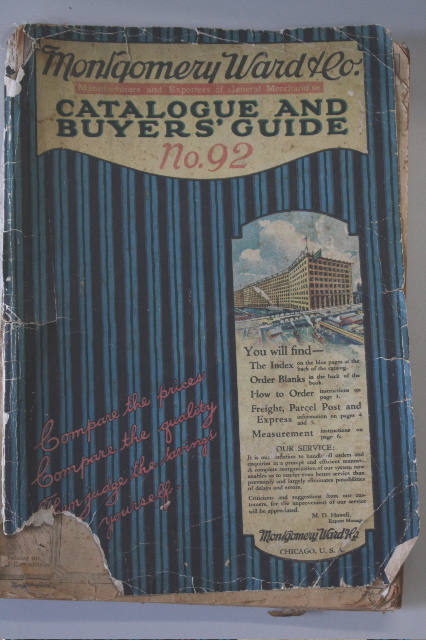 Whatever its origins, the catalogue is a fascinating source of information about all manner of everyday activities, covering as it does goods ranging from farm machinery, vehicles, furniture and furnishings to clothing, shoes, patent medicines, toys and games, books, musical instruments and much more. 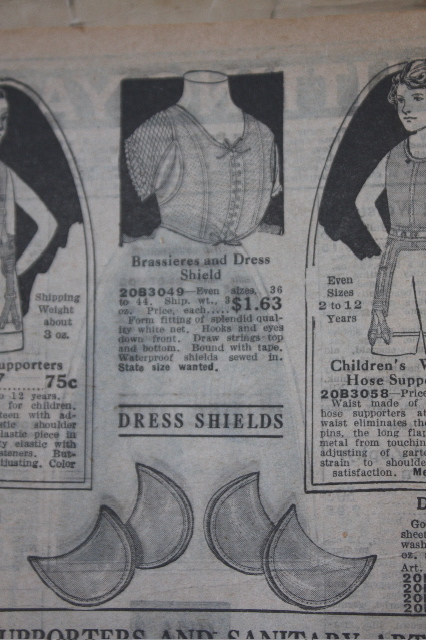 The clothing sections are lavishly illustrated with detailed descriptions, and while most are black and white, there are some colour plates. Click on the photos to enlarge them. 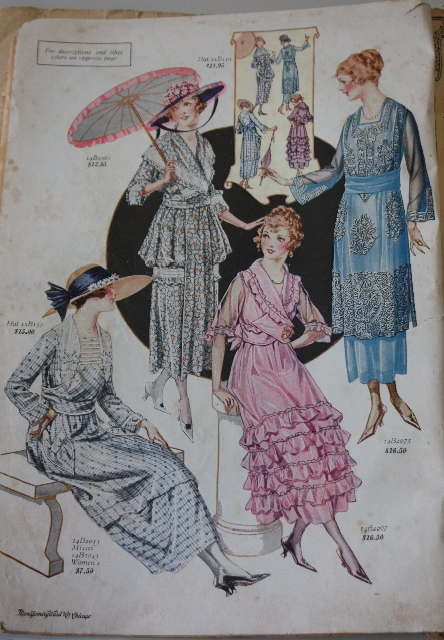 Many of these dresses seem more frilly than I had imagined clothes of that era to be – perhaps they became more tailored later in the decade. In the women’s underwear section there are some astonishing garments I had never heard of including these scary-looking ‘maternity corsets’, advertised as providing ‘support’. 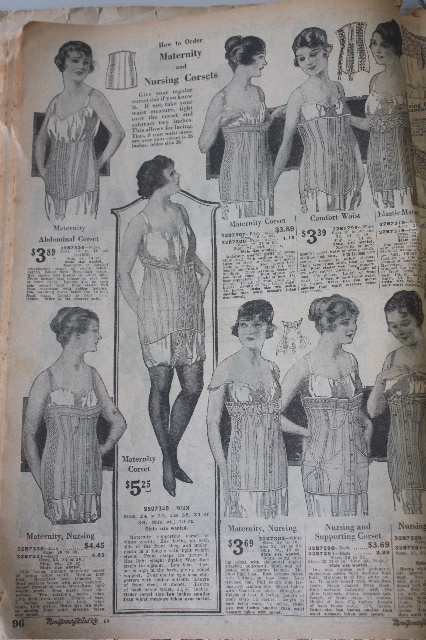 Then there is the ‘envelope chemise’, a kind of cross between a petticoat and bloomers, and the ‘boudoir cap’, presumably for wearing in bed. Envelope chemise - almost a chastity belt! 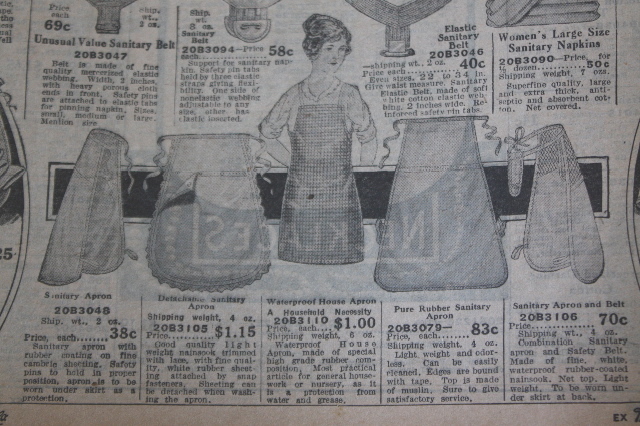 Amongst the ‘hose supporters and sanitary articles’ there is the ‘sanitary apron’, to be worn backwards inside a skirt , and the ingenious combined ‘brassiere and dress shields’. These are just a few glimpses into over 470 crowded pages – it really is an amazing historical source. Jeannette, who is now 90, wants to give the catalogue to an appropriate archive or library, and has asked my advice. I’m a bit stumped. Do the Gloryboxers have any suggestions? This is fascinating. It would make a great e-book! The underwear is really interesting. The purpose is to conceal, mold and enhance the body at the same time. The maternity corset hides pregnancy but also ensures a trim figure for others to admire. There’s also all sorts of stuff designed to conceal bodily functions. 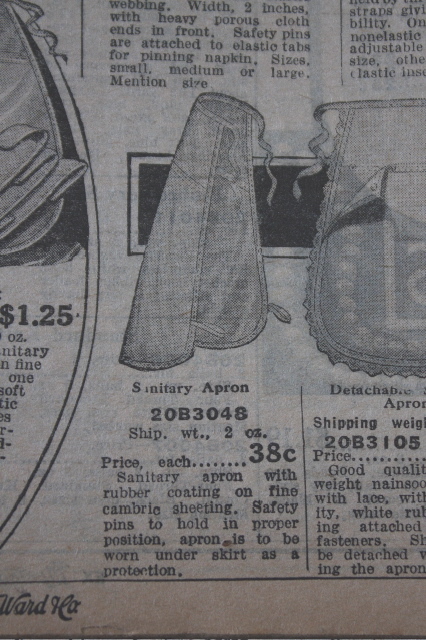 Presumably the sanitary apron prevented menstruation ‘accidents’, while the dress shield (or more specifically the waterproof shields) protected the outer layers from sweat stains. Plunket founder Frederick Truby King would have had strong words to say about some of these – he was firmly opposed to maternity garments (I find myself in agreement here) and thought bras were the ‘invention of the devil’ (not so sure about that one). This is an amazing resource Nancy. It tells us a lot about women’s bodies in this period. As for your question, I’d suggest getting in touch with Te Papa in the first instance. The Costume & Textile association(http://www.costumeandtextile.co.nz) might also be able to offer some advice. These old catalogues are priceless and need to be kept in stable conditions. It’s a paper object, therefore needs to be stored as such, so not directly connected to the Costume & Textiles Association. I would suggest that Ak Museum be approached first, as there appears to be a direct connection with the department store owner. Second, Waikato Museum, to reflect the donor’s location (and I have the contact name there). Thanks very much for your comments and advice Pip. I can testify to the catalogue being fragile – the cover is no longer attached and parts of the index at the back are in tiny fragments. However most of it is in remarkably good order. 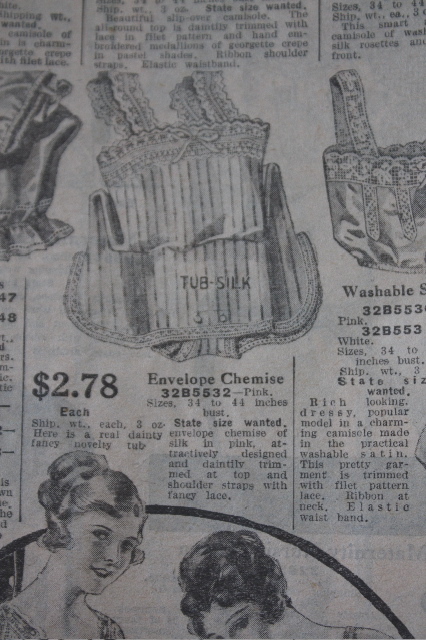 I wonder what ‘tub’ silk was … it’s mentioned in the ad for the chemise.